Download "Human Nutrition - Dietetics Department of Nutrition 303.352.7008"
4 Third Year Arts and Humanities Requirement (GS-Arts and Humanities) Historical Requirement (GS-Historical; recommended to select course that also meets Global Diversity requirement) NUT 140, Human Nutrition NUT 00, Cultural Aspects of Nutrition (Multicultural) NUT 700, Nutrition Education and Counseling NUT 500, Food Safety NUT 290, Lifecycle Nutrition for Majors Arts and Humanities Requirement (GS-Arts and Humanities) HCM 020, Management Principles in Health Care HTE 60, Labor and Production Control Total Fourth Year NUT 4720, Pre-Professional Seminar in Nutrition and Dietetics (Senior Experience) NUT 4100, Advanced Human Nutrition NUT 4700, Medical Nutrition Therapy I Electives 6 NUT 4750, Medical Nutrition Therapy II NUT 4210, Community Nutrition Electives 9 Total Written Communication (first credits), Oral Communication, and Quantitative Literacy requirements must be completed within the first 0 credits. The remaining credits of Written Communication coursework must be completed within the first 45 credits. All General Studies requirements must be completed within the first 90 credits. 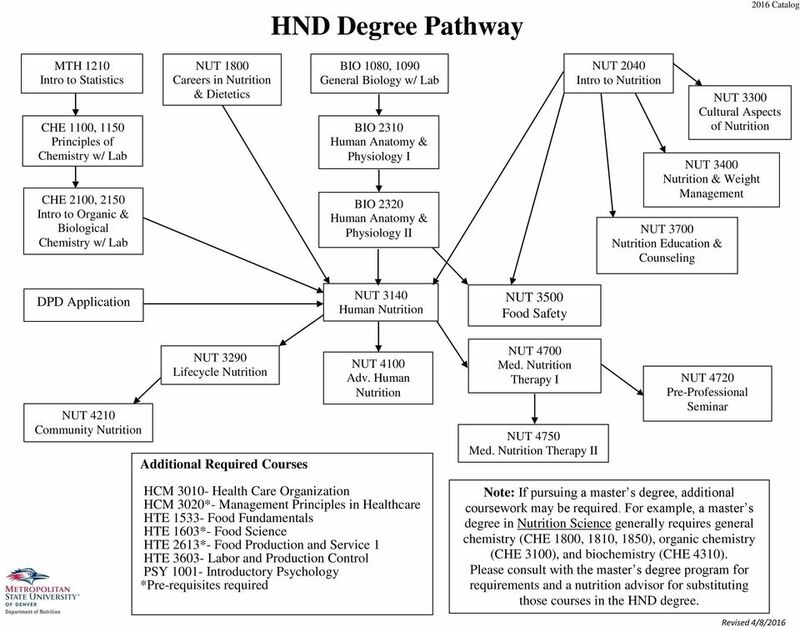 5 HND Degree Pathway 2016 Catalog MTH 1210 Intro to Statistics CHE 1100, 1150 Principles of Chemistry w/ Lab CHE 2100, 2150 Intro to Organic & Biological Chemistry w/ Lab NUT 1800 Careers in Nutrition & Dietetics BIO 1080, 1090 General Biology w/ Lab BIO 210 Human Anatomy & Physiology I BIO 220 Human Anatomy & Physiology II NUT 2040 Intro to Nutrition NUT 400 Nutrition & Weight Management NUT 700 Nutrition Education & Counseling NUT 00 Cultural Aspects of Nutrition DPD Application NUT 140 Human Nutrition NUT 500 Food Safety NUT 4210 Community Nutrition NUT 290 Lifecycle Nutrition Additional Required NUT 4100 Adv. 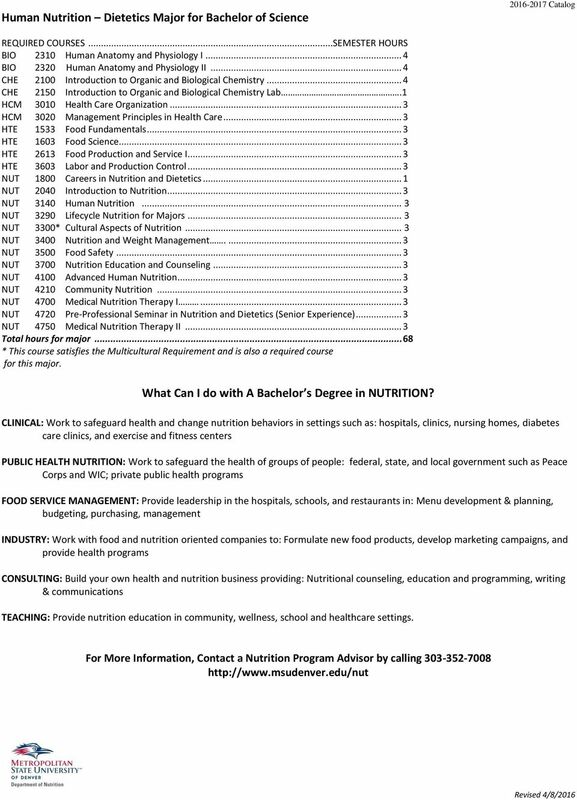 Human Nutrition NUT 4700 Med. Nutrition Therapy I NUT 4750 Med. Nutrition Therapy II NUT 4720 Pre-Professional Seminar HCM 010- Health Care Organization HCM 020*- Management Principles in Healthcare HTE 15- Food Fundamentals HTE 160*- Food Science HTE 261*- Food Production and Service 1 HTE 60- Labor and Production Control PSY Introductory Psychology *Pre-requisites required Note: If pursuing a master s degree, additional coursework may be required. For example, a master s degree in Nutrition Science generally requires general chemistry (CHE 1800, 1810, 1850), organic chemistry (CHE 100), and biochemistry (CHE 410). 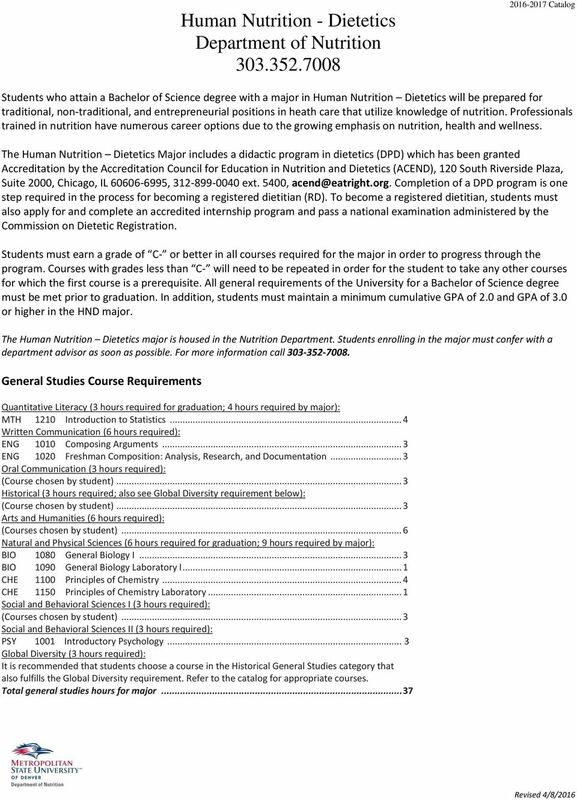 Please consult with the master s degree program for requirements and a nutrition advisor for substituting those courses in the HND degree. 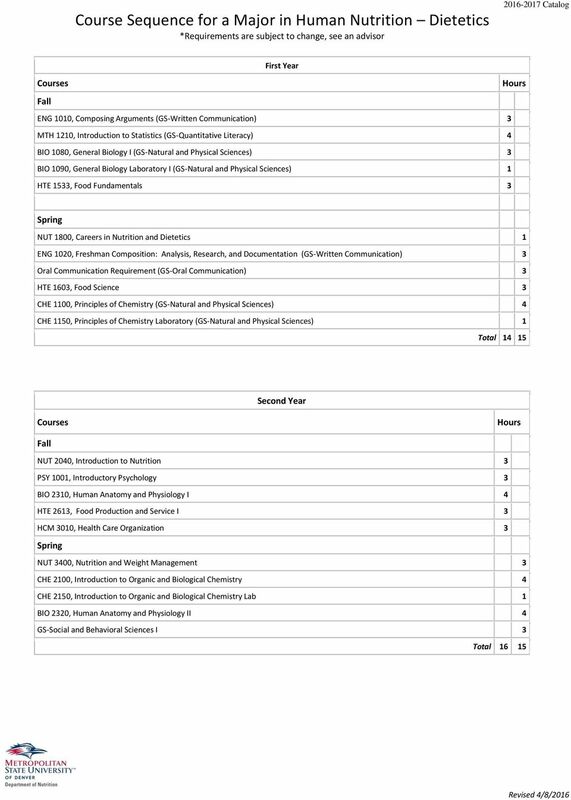 New Degree Proposal B.S. Nutrition February 2009 The following proposal was developed by Jamie Erskine, Ph.D., Professor, Dietetics and reviewed by Ellen Meyer Gregg, Ph.D., Director, School of Human Sciences. 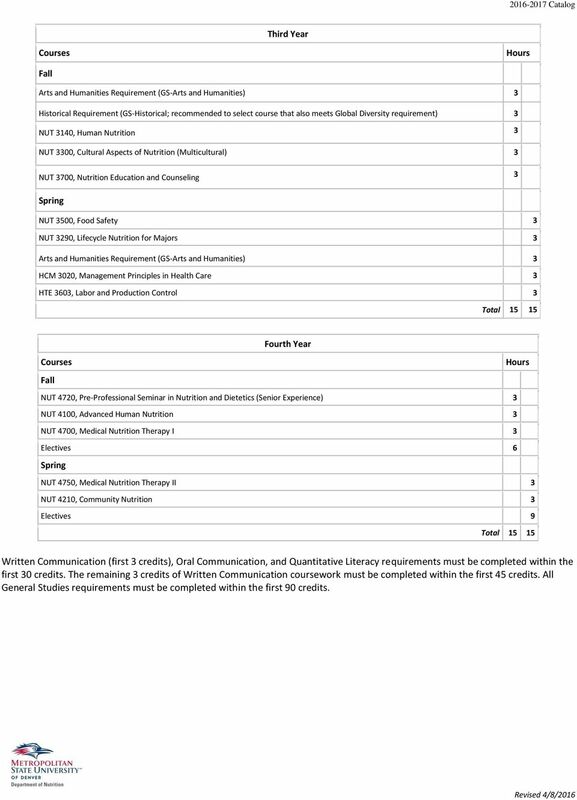 UNCG School of Nursing Basic Pre-Licensure BSN Degree Information 2015-2016 The Bachelor of Science in Nursing (BSN) program is designed to be completed in four academic years plus one summer session. Allied Health Sciences with Respiratory Care Emphasis Secondary Admission Required Respiratory Therapists provide direct patient care for those who have trouble breathing across a broad scope of reasons.